Personalized Service Anniversary Award Presentation Packets from Select-Your-Gift provide an easy-to-administer and easy-to-use corporate awards program to recognize and show appreciation for your employees' service and achievements. Studies have shown that employee service award programs can have a significant impact on employee engagement by helping to improve employee morale and loyalty to your company. Corporate Service Milestones: Traditionally, companies start recognition upon the 5th service anniversary, and then at 5 year intervals. Today, due to the changing requirements of the workforce, more companies are also recognizing earlier service milestones, including the completion of an on-boarding process, or probationary period, and the completion of 1 and 3 years of service. These additional -early- employment milestones are great opportunities to recognize your newer employees, and helps to boost their morale and their level of engagement. When planning your new Employee Service Award program, or updating an existing program, we want you to have the most information possible. So we prepared an eBook: "Guide to Employee Service Awards" and it's yours free when you contact us for more information about starting your corporate anniversary awards programs. The actual presentation of employee anniversary awards is a very important part of service recognition. When possible, present each corporate service award to the employee in front their peers. These award events provide management with excellent opportunities to highlight an employee's recent contributions, while demonstrating and promoting your company's values. 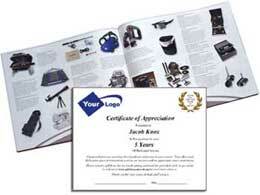 Upon receiving a Corporate Service Award Packet, the employee can select a gift from the provided catalog, or online with almost twice as many items shown. The selected corporate anniversary gift is quickly sent directly to the employee's home within the lower 48 US. See additional Service Award Articles in our BLOG.